Bristol Bay (Iilgayaq in Central Yup'ik) is the eastern-most arm of the Bering Sea, at 57° to 59° North 157° to 162° West. It is located between the southwest part of the Alaska mainland to its north, and the Alaska Peninsula to its south and east. Bristol Bay is 400 km (250 miles) long and 290 km, (180 miles) wide at its mouth. A number of rivers flow into the bay, including the Cinder, Igushik, Kvichak, Meshik, Nushagak, Naknek, Togiak, and Ugashik. Upper reaches of Bristol Bay experience some of the highest tides in the world. 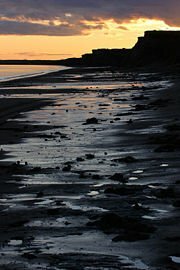 One such reach, the Nushagak Bay near Dillingham and another near Naknek in Kvichak Bay have tidal extremes in excess of 30 feet (9.9 m), ranking them — and the area — as eighth highest in the world. This, coupled with the extreme number of shoals, sandbars and shallows, makes navigation troublesome, especially during the area's frequently strong winds. As the shallowest part of the Bering Sea, Bristol Bay is understandably one of the most dangerous areas for large vessels. This is one reason why the Bristol Bay commercial salmon fishing fleet is limited to 32-foot (10 m) overall keel length. In addition, most of the area is not well documented by nautical charts and navigational aids are sparse. Anciently, much of Bristol Bay was dry and arable, along with much of the Bering Sea Land Bridge. More recently, its proximity to mineral, animal and seafood riches provided incentive for human habitation along its shoreline. Early Russian and English exploration provided most of the non-native influences of the area. During his voyage through the area in 1778, the famed British Navigator and explorer, Captain James Cook named the area "in honor of the Admiral Earl of Bristol" in England. After establishing some temporary settlements in the late 1790s, The Russian American Company sent exploratory parties to document the coast and nearby inland areas of Bristol Bay. One of these charted the area between the Kuskokwim and Nushagak Rivers. Later, in 1819, an Aleut by the name of Andrei Ustiugov drew the first intensive charts of Bristol Bay. Additionally, ships of the Russian Navy conducted extensive surveys of the Bering Sea coastline into the mid-1800s, naming many of the geographical features commonly used today: Capes Constantine, Chichagof, Menshikof and Greig, Mounts [[Veniaminof] and Mount Pavlof, Becharof Lake, etc. Bristol Bay is home to the world's largest sockeye salmon fishery as well as strong runs of chum salmon, silver salmon and king salmon, each occurring seasonally. Major industries are commercial fishing and the associated canneries, sport fishing, hunting and tourism. The number of commercial lodges, hunting- and fishing-resorts and visitors to the nearby Katmai National Park and Preserve has grown exponentially in recent years. The area has also experienced significant interest in oil and mineral development, most notably with the proposed Pebble Mine on the north shore of Iliamna Lake, and auctioning of leases to tracts in the southern Bristol Bay area known as the North Aleutians Basin, an area which has been closed to offshore oil and gas development since a moratorium in 1998. The draft plan by the Bureau of Land Management (pending public comments until 2/5/2007), also proposes to open most of the BLM's 3.6 million acres (15,000 km²) in the area to hard rock mining and oil and gas drilling. The three largest communities of the Bristol Bay area are Dillingham, King Salmon, and Naknek. Smaller communities (villages) which dot the coastline and rivers of Bristol Bay include: Egegik (pronounced IG-eg-ick), Ekuk (pronounced É-kok), Igiugig (pronounced É-gee-YAW-gig), Manokotak (pronounced mana-KOE-tak), New Stuyahok (pronounced STEW-ya-hock), Newhalen, Nondalton, Pilot Point, Port Heiden, and Ugashik (pronounced yew-GASH-ik). All of these communities are primarily inhabited by Alaska Natives, except for Dillingham, Alaska and King Salmon, Alaska; the former being influenced early-on by white salmon-cannery employees of European descent and the latter being heavily populated by military personnel stationed, primarily during Cold War years, at the nearby King Salmon Air Force Station and later by visitors and employees of the nearby Katmai National Park and Preserve. King Salmon is the major hub to major fisheries and area attractions in Bristol Bay. From Anchorage you will need to fly with Alaska Airlines or Peninsula Airways to King Salmon. Grant Aviation provides daily scheduled flights and charters between King Salmon the and Iliamna Lake villages of Igiugig and Levelock, Upper Peninsula villages of Egegik, Port Heiden, Pilot Point and Ugashik, Chignik region including Chignik Bay, Chignik Lake, Chignik Lagoon and Perryville. Charters can be arranged to take you to just about any other area of interest in the Bristol Bay region. Cargo service is also available. Reservations can be made by calling (907) 246-3590 or toll free at (855) 246-3590. For more information download the full printable Visitor Guide and Business Directory.